SOYBEAN RUST still only found in kudzu in Decatur and Grady Counties, though it has likely spread. 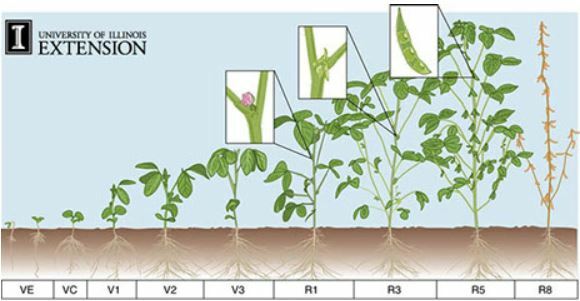 Remember that critical times to protect the soybean crop are between first bloom (R1) and full-seed (R6) growth stages. COTTON: Target Spot is here and across the Coastal Plain. Not every grower will benefit from protecting the crop with a fungicide; however every grower SHOULD be aware of the potential for loss and the opportunity to protect the crop. 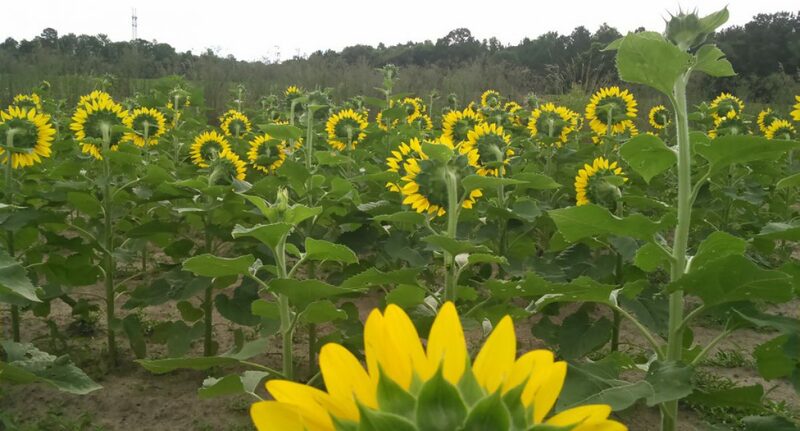 Considerations for protecting the crop should be made from the first week of bloom through the sixth week of bloom. Growers are encouraged to scout their fields for early detection of the disease; conditions are perfect now. When defoliation of the crop is greater than 25% or so, it is not clear a fungicide will help any more. AREAOLATE MILDEW of cotton (looks a lot like a powdery mildew) is reportedly back in some cotton as far west as Colquitt County. Normally areolate mildew comes in late and does not cause a problem as far as yield goes; however if the diseases develops early, premature defoliation could be a problem. If areolate mildew develops well before intended defoliation timings, fungicides (same as used for target spot) could be helpful, though WE HAVE VERY LITTLE DATA TO SUPPORT that recommendation. Peanut White Mold – NO PROGRAM WILL KEEP ALL WHITE MOLD OUT OF A FIELD. Individual affected plants are going to happen. A good program keeps individual hits of white mold from turning into 10-foot runs of wilted plants. 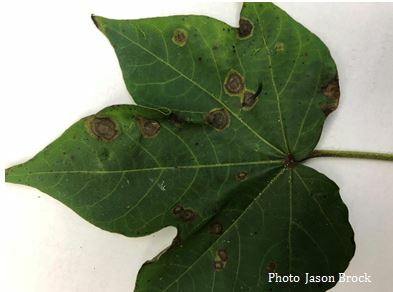 More on Cotton – Stemphylium leaf spot is characterized by numerous small spots with dark purple/brown margins and often times gray, papery centers. This disease occurs when the cotton plant is deficient in potassium; potassium deficiencies may exist because of poor soil fertility, perhaps from leaching, or during periods of drought where potassium is not taken up into the plant. Stempylium leaf spot is managed by insuring proper levels of potassium in the plant; fungicides are not an effective management tool. Target spot became evident in southwestern Georgia in the latter part of July and is likely present in many fields across the Coastal Plain of the state. 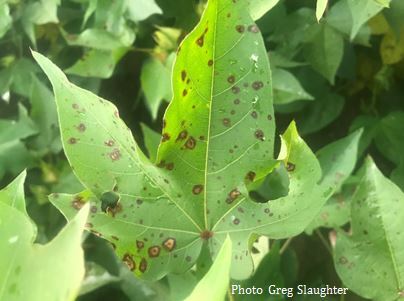 Target spot can develop quickly and is most common in good-growing cotton with high yield potential. Extended periods of leaf wetness, where the foliage in the interior of the canopy remains wet well into the later morning hours, create perfect conditions for rapid development of target spot and premature defoliation from it. Fungicides are an important management tool for target spot, though use does not always result in increased yields. From our research, effective use of fungicides should be considered between the first and sixth week of bloom where the third week of bloom is typically the most critical time of management. Scouting before use of fungicides to determine if the disease is present help to ensure that an application is warranted. Priaxor is currently the most effective fungicide for control of target spot, though Headline, Quadris and others are also effective. Silverleaf whitefly (SLWF) adults have been observed in low numbers in cotton in some areas during the past week to ten days. To date very few immature whiteflies have been observed in cotton. We are not aware of any field which has exceeded threshold for SLWF. Most reports include observations of individuals or a few adults when searching plants for corn earworm. 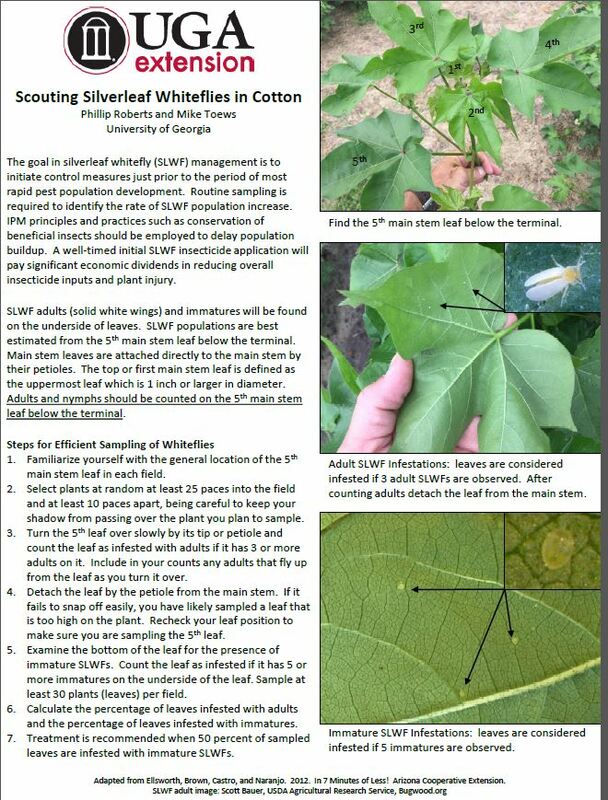 However, the presence of SLWF in a field is worth noting and management of all insect pests must consider the presence of SLWF. All efforts should be made to minimize the need to treat SLWF with insecticide. Scout for the presence of SLWF adults. It is important to know if SLWF is present! Conserve beneficial insects, do not apply insecticides for any pests unless thresholds are exceeded (beneficial insects will also suppress corn earworm). If SLWF is present in a field, avoid use of insecticides for other pests which are prone to flare SLWF. Scout fields frequently for immatures once fields are infested with SLWF. Be timely with SLWF insecticides when thresholds are exceeded (many learned in 2017 that it is difficult to play catchup with SLWF). Be very aware of SLWF infestations in hairy leaf varieties and late planted cotton, these are high risk fields. There is no question that agents, scouts, consultants, and growers are looking more closely for SLWF this year based on the problems we had in 2017. Historically if we see SLWF in cotton during the month of July we should anticipate problems with SLWF, especially on late planted fields, and manage appropriately. Infestations do not come close to where we were a year ago. In 2017 treatable populations first occurred during the last week of June and many acres were treated in July; so we are in a much better situation this year compared to last. It will be important that all fields are monitored closely for SLWF and hopefully proper proactive management can minimize damage and the need for SLWF insecticides.